Make your life a celebration, and celebrate everything. All the saints and great souls who have been born on Earth have given this very same message. They have always urged to uplift mankind and human values. The secret to unconditional love is to accept everyone as your own, because no one is separate. Every state and province in our country has a unique and different cuisine, dance styles, dressing styles and they celebrate festivals in their own unique way too. Today you can see so many dishes from Gujarat laid out before you. Nowhere else in the world will you find so much diversity. I still remember that a few years back when we had an event called Annabrahma in Gujarat, an amazing 5800 dishes were prepared for the celebration. Food from every corner of the country was prepared and presented there – ranging from the Kattha Baingan and Dum Aloo. Dishes from Kashmir to a multitude of dishes from the state of Tripura, and the many varieties of Payasam from Kerala. You can find such an amazing diversity only in India. Just see! From one side we have all the savouries and towards the other end we have all the sweet preparations. I remember an incident from the time I was visiting Lahore in Pakistan. There was a huge meeting arranged in the Lahore University at that time and many young students had attended the meeting. The Vice Chancellor of the University told me, “Gurudev, we have never had such a huge crowd for one event in the history of this institution. There is huge excitement to listen to you”. People had gathered and seated in two or three halls together, such was the crowd. 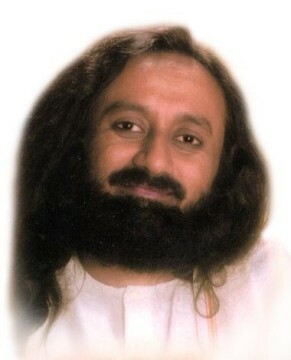 One young student asked me, “Gurudev, in Pakistan we believe in only one God that is Allah. But in India, people believe in so many gods and goddesses. How is this possible?” I replied, “See, from the same wheat flour you make Karachi Halwa (a sweet preparation), a Samosa(savoury snack), Naan (baked flatbread), and Parantha (stuffed flatbread) and even noodles. But ultimately it is the one same flour, isn’t it? Then why do you make so many varieties of dishes from it? In the same way in India we also believe that God is one, just that He arrives or presents Himself in a variety of forms and dresses. That’s all. God does not always dress up like a grand warrior all the time. Every time He dresses in a different attire. But still, God is one”. Hearing this, the boy replied, “Gurudev, I have never heard such a simple and profound explanation”. I said “See, you adore and address Allah by 99 sacred names, isn’t it? 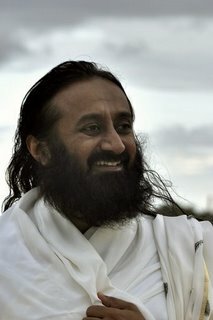 In India we have 108 names for the Divine, just a little more, that’s it”. Religion exists to unite people and bring them together, not to divide them and keep them apart. We all are one. The youth really liked this understanding. Just see, God has created so many different kinds of vegetables. He did not just make only one kind of vegetable isn’t it? God did not only create the eggplant and have everyone only eat eggplant. God created potatoes, tomatoes, okra (ladyfinger), eggplant, etc., and a huge variety of vegetables. In the same way, He also created people of different kinds. So we should bring everyone together and celebrate. This is the essence of Lord Krishna’s message when He said “Dear one! See Me in everyone, and see everyone as Me”. Gurudev, why did Lord Krishna not come to Abhimanyu’s rescue in the fierce battle the way He had rescued and helped Draupadi? What is the secret here? Lord Krishna came to rescue Draupadi when she called Him for help. Abhimanyu (Arjuna’s son) was a warrior. He had decided to sacrifice himself in the war for the noble cause. But he did not learn the intricacies of war completely. He only half-understood them and went off to the battlefield. In a fit of zeal and enthusiasm of a warrior, he drove into battle in the Chakravyuha (an intricate and specific type of battle formation) and got stuck inside. Now, if Lord Krishna wanted, He could have helped avert the entire battle altogether, not just the unfortunate killing of Abhimanyu alone. Such questions can always be asked. Lord Krishna was wise and capable in every way, so He could have easily stopped the battle from taking place. Then why did He not do so? See, Lord Krishna went thrice as an ambassador of peace to strike an agreement between the Pandavas and Kauravas to avert the battle. But every time He had to return empty handed. There is a beautiful story related to this, which I have narrated earlier also. One day Lord Krishna was dressing Himself up in the finest garments, etc., while his charioteer waited outside. The charioteer waited for a long time for his Lord to come out, because Lord Krishna had instructed him to keep the chariot ready. Lord Krishna took time to dress Himself, adjust his crown and ornaments. Now just like a driver sometimes comes in and asks you, “Sir, are we going to go out, or is the programme cancelled?”, Lord Krishna’s charioteer entered His chamber and asked Him, “O Lord! Where are we going today? You seem to be preparing quite elaborately for some meeting”. To this Lord Krishna replied, “I am planning to go meet Duryodhana today”. A driver too has a sense of belongingness and certain right to ask the master, which is why often we see a driver say, “Sir, please do not take this route. Let us drive through the other route today, since there is heavy traffic on the other route”. Lord Krishna’s charioteer too put his concerns forward on hearing His travel plans. Lord Krishna replied, “My dear! Darkness does not come to the Light. It is Light that has to go to the Darkness”. Then Lord Krishna also said, “See, Duryodhana does not recognize Me and who I really am. He only recognizes outward appearances and outward display. Duryodhana will only see what I am wearing, what kind of chariot I have come by, and what kind of clothes and ornaments I am wearing.” Lord Krishna was very intelligent in every way. Now there is a question asked, as to how Lord Krishna ended up having 16,000 wives. Do you know how the modern city of Baghdad (Iraq’s capital city) got its name? How many of you here know the story behind Baghdad’s name? In ancient times, there was a wicked king by the name of Narakasura. He had a son called Baghadutta. From his name Baghadutta came ‘Baghdad’. The king Narakasura ruled over that region which is now Iraq. He had 16000 wives or consorts. He would marry any woman he liked. He caused a lot of pain and trouble to the people of the kingdom. 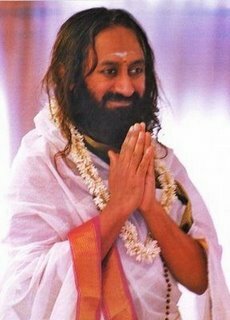 When I had gone on a visit to Iraq recently, people there told me, “Gurudev, there are about 100 villages here where there is not even a single male person. Saddam Husain had every man in these 100 villages killed at his command, so that there are only women present now. Narakasura had done a similar thing in the past, some 5000 years ago. It is surprising to see how history has somewhat repeated, and what kind of impressions are carried by that place even till today. So Lord Krishna went there and killed Narakasura. Now after the king’s death, the 16000 ladies decided that they will commit suicide (as they had lost their husband), because they will not be accepted back into their father’s home as they were married. The land had been freed from Narakasura’s wicked rule and was called asPragjyotishpur. Do you know what Ahiganasthana means? It means a place which has many different species of snakes. The root ‘Ahi’ has two meanings here. One meaning is a snake, and the other refers to naturally occurring minerals. After Narakasura’s slaying, Lord Krishna installed Baghadutta on the throne of Pragjyotishpur and since then the name of the place got changed to Baghdad. There is a place called Tikri where Lord Krishna stopped to rest for a while, using a Tikaav (a bedrest or seat support). All these 16000 wives came to meet Lord Krishna there and expressed their desire to commit suicide, since their own families would not accept them back as they were Narakasura’s wives, and would insult or admonish them for being consorts of such a wicked king. They did not wish to live the rest of their lives with such a stain or blemish on their character and modesty. Then Lord Krishna stopped them, and said that, “I will pass on my surname to you. You can then say that you are my wives”. In order to uplift the sense of dignity and self-respect of those women and save them from committing suicide, Lord Krishna in this way married all the 16000 women in one day. In a way, Lord Krishna gave those women Jeevan-daana or the gift of a new life. Otherwise no man was ready to accept and marry any of the women. So when these ladies returned as the lawful wives of Lord Krishna, they were received with great respect and honour in the society.